Twitter is not about ‘What are you doing’ anymore. Twitter has long become the voice of businesses and brands. Even those who aren’t already using Twitter for business reasons are taking new interest. Twitter’s home page redesign from just a status update to showing current Twitter trends. Twitter’s web interface might suit a casual individual. But, you can’t manage a corporation’s Twitter identity from Twitter’s web interface. Adobe Air Client like TweetDeck lets you manage multiple Twitter accounts as well as let you have multiple interfaces open with different views, etc that can help an individual manage it professionally. 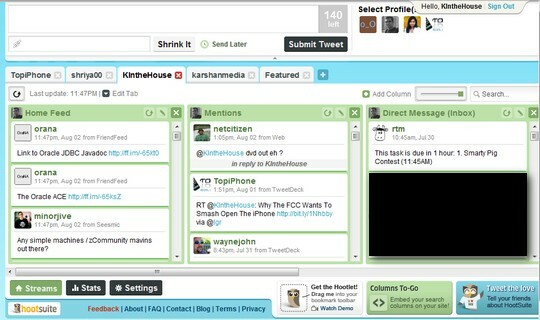 HootSuite is a new web based Twitter management tool that shows great promise. HootSuite aims at managing your brand’s Twitter presence through a team of professionals. As you can see, HootSuite with their current v2.0 offers excellent features that can make your Twitter management experience a pleasure. HootSuite is currently free but soon different pricing plans will be announced with various feature sets. HootSuite is definitely a great tool to manage your Twitter presence if you are individual with multiple Twitter accounts or a business with a team of people managing Twitter profiles. A client had asked to investigate the applicability of business uses for Twitter. I guess it’s good to facilitate opinoon polls and also augment customer service, too. I’ll give Hootsuite a try and see if it can serve as the main management app for my client’s Twitter presence. I’ve seen plenty of messages on twitter saying “sent from HootSuite”, but never realised until now exactly what it was. I think I might actually give this a try as I have a couple of accounts – one for business, one personal. James, I am using HootSuite just for sharing it via the bookmarklet for my own blog posts to see how they trend and which ones attract more clicks on Twitter. It really is eye-opening. Great stuff. I’ve been using Tweetdeck and dabbled with Twhirl but HootSuite sounds great. I’ll probably mention this in one of my videos on YouTube. Thanks for the info. thank to you to most valuable sharing.